PX30-L Lithium replacement for Mercury PX30. Battery equivalent to L30PX, PX30, EPX30, 2LR53, 1202AP. Type: Lithium (replacement for original alkaline). Voltage: 3 V.
Height: 11.9 mm. Diameter: 23.4 mm. Price: £10.49 each. £9.99 each if you buy two or more. Postage and packing included. 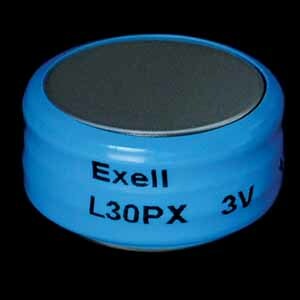 Replacement for: L30PX, PX30, EPX30, 2LR53, 1202AP. The original alkaline battery was widely used in cameras, but is no longer manufactured. The PX30 was once very popular for use in Minolta 16 QT and Kodak Instamatic X-35, X-45 and X-90. Our PX30-L battery is a lithium replacement that faithfully reproduces the dimensions of the original, and precisely matches the 3.0 volts of the original, breathing new life into countless vintage cameras. The lithium chemistry means is has 60% more energy that the original and contains no added mercury and so is environmentally friendly. The original PX30 battery was made up from two PX825 cells (also known as LR53 cells) and often, two PX825 cells were used in place of one PX30. If your application calls for two PX825s in a stack, use a single PX30-L instead. These PX30-L batteries have a shelf life in excess of ten years. Why not buy two or more packs, take advantage of our reduced price and make sure you are not left unable to use your classic camera next time your battery runs out.